I've talked a little bit about living alone before, but I thought I'd make a whole post about it for those of you who are currently looking for apartments for the fall. I decided to live alone after having roommates all four years of college because at some point you have to tell your friends I love you, but not enough to clean up after you. 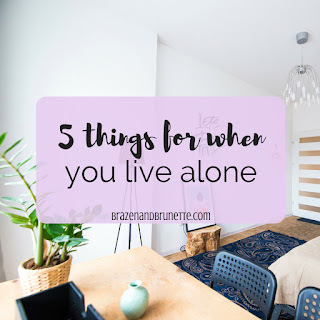 I knew that no matter where I ended up at law school, I wanted to live by myself because there's a difference between your roommate kept down down and dead silence quiet, and I knew I'd need the latter. So now I'm sans roommates and while it's a big step and can be really scary at first, I think everyone should do it at least once in your life because you REALLY get to know yourself. So if you do, here's what I think you should look into getting! At some point you're either going to go a whole day without talking out loud or you're going to start talking to yourself. Both are kinda weird, so having a pet makes you feel less weird about it. But trust me, a fish or something else little won't really help that much. Get you something that you can cuddle with (or hold hostage, close enough). It makes things a lot less lonely. I grew up in a family of 4, so all of the recipes I know have portions way too big for me and I always end up with its of leftovers. The good part of this is that it's kinda like meal prepping so if I'm feeling lazy or busy, I can just pop one in the microwave and have an easy meal that isn't fast food. For graduation, I received these Rubbermaid containers and I used them here and there in undergrad, but I seriously use them every day now! To be honest, living alone makes you really paranoid. It does get better, though! I think part of it is because you know that if someone were to break in, there'd be no one else to protect you and everything they'd steal would be yours :/ To make me feel a little better about this, my parents got me an outlet timer for a lamp in my living room and I use it every time I go out of town for the weekend. Even if it actually wouldn't fool a burglar, I feel like it's better than nothing so it gives me some peace of mind. Update: I've upgraded to a smart plug so that I can turn it on/off even when I'm not home. My biggest fear is running out of TP since there's no one I can text to throw me a roll. Luckily this hasn't happened yet because I bought a 48 pack when I was doing my semester stock up and now I have a dash button so that I literally never run out. It sounds silly, but you probably never thought of this dilemma when you had roomies. Better safe than sorry! When you live by yourself, it can get lonely. After I made my bar shelf, I got so excited I invited everyone over so I could have an excuse to show it off and use it. I wanted a bar cart, but space is limited so I went for an A-frame shelf instead. This worked out great because it's equal parts bar cart and shelf for my law books. Just because you live alone doesn't mean you have to be alone all the time! I love your idea of the bar shelf instead of a bar chart. I saw a beautiful bar cart at Target and I was going to buy it except for the space in a small apartment. I definitely need to get a timer because I'm always so paranoid about leaving the oven on. That same thing happened to me which is how I ended up with a shelf! 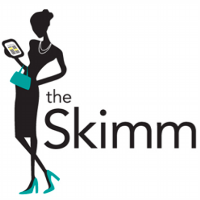 Thanks for linking your blog, I loved your post about building a resumé!